If card text was something like that: "Return a random friendly minon to your hand. If that minion has Deathratte trigger it." we would probably see this card more often. Would be very strong synergy among deathrattle rogue decks. Why not Blizz ? Blizz.. ? Oh Kidnapper. Rogue has so many ways to bounce things back to the hand. You could imagine a battlecry themed deck with vanishes, shadow steps, brewmasters, and these babies all doing work; however, the problem is simply a lack of battlecries you'd want to do over and over again. The closest thing to such an archetype is mill rogue but that suffers from a lack of battlecries which are devastating to repeat over and over. There's Coldlight Oracle, yeah, there's Antique Healbot, fine, but if you don't draw your Oracles you generally die. King Mukla is decent to repeat over and over but while he helps, he does not actively win the game the way that repeated Coldlight Oracles can. This minion belongs in a deck where you either utilize its effect or either minimize it to the point where it's almost like it doesn't exist. Imagine a spell heavy Rogue deck that hardly has any minions on the board, so this has nothing to send back. 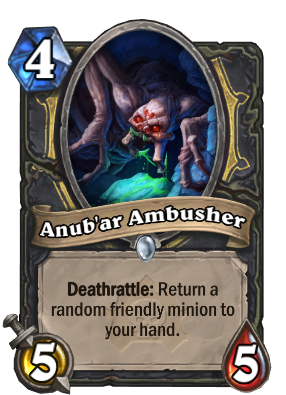 Edit: After having tried it, I've deduced that this card is supposed to be in a control based Rogue deck, something that still isn't all that popular and definitely didn't exist back when it was released in Naxxramas (July 2014). All in all I quite like this card and hope to see it being used. Sadly, noone is playing this card in any deck. A real disappiontment. You don't get it... he likes THEM ALL! In addition to aggro could be an powerful support minion for a weapon based rogue deck. This card is pretty much ideal for so many situations. Hmmm will have to try this card out in my Rogue deck, we'll see how well the mechanic works. This guy brings the beef. He's great at any point on the curve where you can cast him. His drawback is often not really a drawback in rogue anyway. And even with the drawback he's more than massive enough to warrant it. Good card. I'm expecting to see this pop up in a lot of rogues not bent on trying to miracle. Whatever you do, don't draft this in arena. It may look like a good substitute for a Chillwind Yeti or Sen'jin Shieldmasta. Rest assured, though, that your opponent will find a way to turn your tempo advantage back so far that you will never recover. Very Good in aggro rogue, but for other decks, pretty useless.. This cards seem very good. The "drawback" likely isn't even a drawback most of the time. Rogue need a solid 4 drop...should be good combo'd with a coin 3 drop SI:7 Agent 3/3 rogue drop as well. Nice card, I thing is good for miracle and tempo rogue. It is not easy to remove a coin turn 3 5-5 minion..